generating more revenue for you. But first, you need an eye-catching logo! Our award-winning designers will listen to your ideas and offer creative advice on how to get the most DYNAMIC look for your advertisement. Whether it's a business card, a brand new logo, or just a new parking sign, we're here to help you get exactly what you need. All of our vinyl graphics, and many of our signs, are produced in-house. When your sign is ready to leave our facility, we're ready to install it. Dynamic Signs Inc. is equipped with lifts and bucket trucks as well as trained staff, to safely and professionally install any kind of sign or banner. Our goal is to provide our customers with the most visible and dynamic signage, to better attract attention to your advertisements. To be certain your signage reaches its potential we offer to thoroughly inspect your property in order to acquire accurate measurements, determine electrical access, and assess permit regulations for your location. and will notify our clients of citations as needed. When necessary, we will consult engineers to ensure your structural signage is safe and to code. 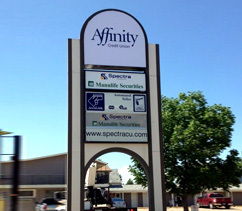 Weather and traffic can be rough on a sign Dynamic Signs Inc. offers to maintain and repair all types of signage. From bulb changes to LED ballast repairs, we're ready to make your old signage shine like new.